Wellingham is a small parish situated in the Breckland Local Government District. It is approximately 9km southwest of Fakenham, and has an area of 437 hectares. The name ‘Wellingham’ is thought to derive from the Old English for homestead of the people by the stream, though what stream this name refers to is unclear. The earliest recorded objects are a number of Neolithic and prehistoric tools (NHER 16948, 17070, 17071 and 17072), mostly of uncertain identification and original location. 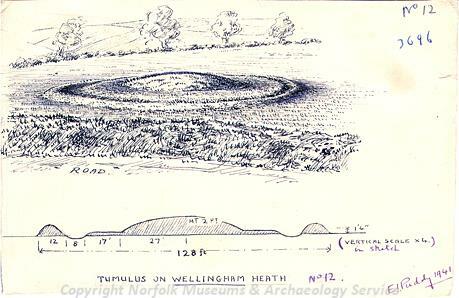 The sites of two round barrows have also been recorded (NHER 3696 and 11592), although unfortunately both have been destroyed by modern agricultural techniques. Evidence for the Roman period is limited to three pottery sherds (NHER 3710), despite the fact that the Roman Road from North Pickenham to Toftrees (NHER 3697) crosses this parish. However pottery sherds from the Saxon period are more numerous (NHER 3710, 3711 and 3713), and metal detecting has also recovered a small number of metal objects (NHER 3713). These include an Early Saxon hanging bowl escutcheon and a Middle Saxon pin. Wellingham is also mentioned in the Domesday Book of 1086, and although it is not highly valued by the medieval period there was wealth enough to fund the construction of St Andrew’s Church (NHER 3731). The earliest part of the present day building are the large lancet windows dating to the 13th century, but the most visually interesting part of the church is the painted dado screen which dates to 1532, and survives almost completely intact. No other medieval building survives, although the earthworks of medieval house platforms, as well as ridge and furrow and a possible hollow way (NHER 29728) have been noted. Other medieval evidence is limited to pottery sherds (NHER 3714 and 32848). Only one building from the post medieval period has been recorded, and this is Uphouse Farmhouse (NHER 37392), which is bisected by the parish and district boundaries. The building itself dates to around 1700, with later details, and incorporates some unprovenanced medieval stonework.